Frequentis Comsoft is an international solution provider to the air traffic management (ATM) industry, headquartered in Karlsruhe, Germany. The company provides solutions in the aeronautical messaging handling and surveillance domain to civil and military air traffic control authorities and organisations, as well as entities in every International Civil Aviation Organisation (ICAO) region. Quadrant is an advanced modular surveillance solution designed to provide automatic dependent surveillance-broadcast (ADS-B) and multilateration within a single platform. Quadrant is an expandable solution that provides independent, genuine, 3D position measurements using multilateration techniques. A single sensor is capable of offering extended surveillance coverage that was previously unavailable. Additional sensors can be added at a low cost, further expanding coverage to overlap surveillance with optional multilateration. 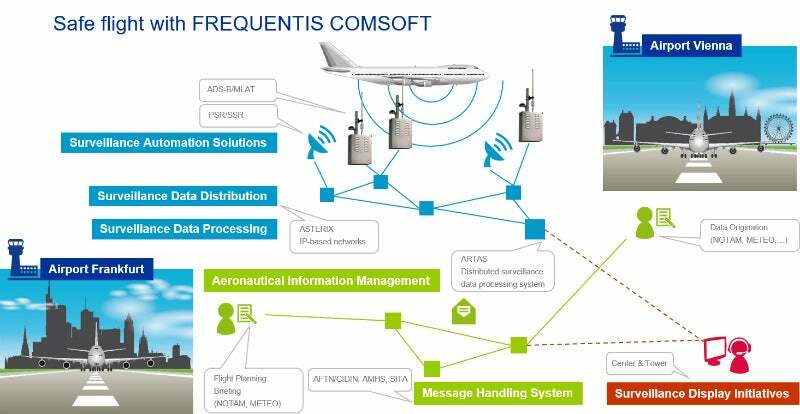 Aeronautical Integrated Data Exchange Agent – Next-Generation (AIDA-NG) is Frequentis Comsoft’s market-leading integrated AMHS solution. It is based on European ATM Communication Gateway (ECG) software, which was developed in cooperation with Eurocontrol. 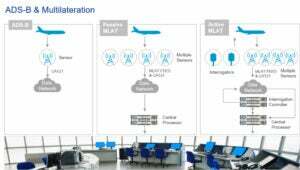 The system offers a highly versatile communication gateway that integrates aeronautical fixed telecommunication network (AFTN) / Common ICAO Data Interchange Network (CIDIN) technologies with SITA in a single platform. These services are ideally complemented by Frequentis aeronautical e-services. Surveillance Data Distribution System – Next-Generation (SDDS-NG) is an advanced solution for interconnecting surveillance sensors using the All Purpose Structured Eurocontrol Surveillance Information Exchange (ASTERIX) standard. It supports full integration and interoperability of all current and future surveillance distribution needs by providing a single access point for surveillance data. The system directly incorporates legacy serial interfaces, communication protocols and data formats. As a turnkey SDDS-NG supplier, Frequentis Comsoft provides its customers with the ability to operate legacy formats and equipment when necessary. 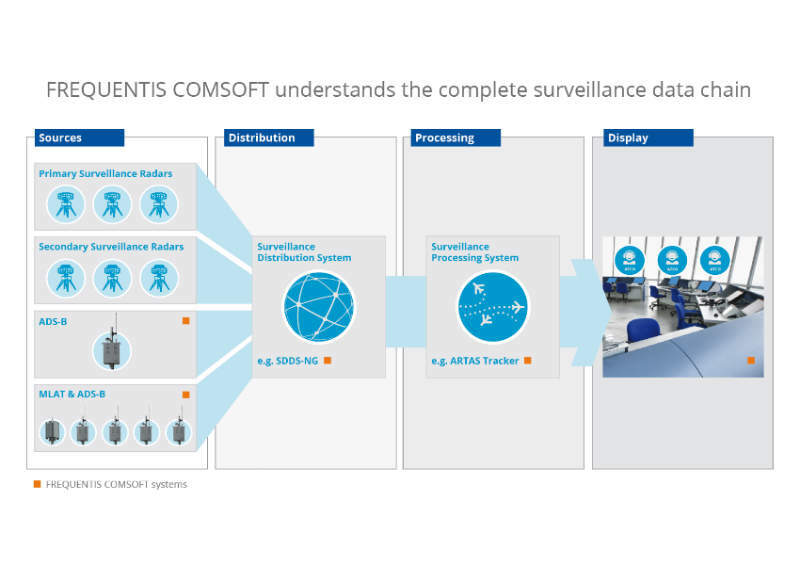 Frequentis Comsoft is a bespoke service provider for the deployment and integration of EUROCONTROL’s ATM surveillance tracker and server (ARTAS). The system combines a range of surveillance data sources for a coherent and accurate air situation picture, using advanced tracking technologies to deliver optimal accuracy and reliability levels for data output. Frequentis Comsoft is the current EUROCONTROL industrial partner for the maintenance of ARTAS, and is an ARTAS distributor for the deployment and integration of ARTAS systems in non-EUROCONTROL member state organisations. The Air Situation Display (ASD) is a configurable human-machine interface (HMI) that is designed for seamless air / ground awareness for ATC operators and aerodrome flight information service officers. ASD features a main traffic window that allows operators to focus on traffic in the assigned area. Additional support subwindows offer precise information to reduce workloads, which deliver real-time safe and efficient flight management. The system has a range of open software modules for civil and military applications, including safety nets and flight data processing. Frequentis Comsoft was established as a small communication company in the late 1970s. In 1989, EUROCONTROL tasked the company with the development of Surveillance Message Conversion and Distribution Equipment (RMCDE), which was the company’s first ATM solution. The company develops products to meet fast-growing industry demands and developments. Its portfolio includes modern solutions for the ATM industry, including innovative surveillance and communication programmes such as ADS-B, ATM automation modules, as well as aeronautical message handling systems and surveillance data systems. Supplying solutions for more than 80% of international AMHS, Frequentis Comsoft is a leading provider of communication systems, with its products used by more than 120 clients in more than 80 countries. In 2016, Comsoft became part of the Frequentis Group and has since been operating as part of the corporate organisation, contributing its wide range of enhanced expertise for safety-critical applications. As a member of the group, the company has access to international sales and service network across more than 50 countries. Frequentis and Comsoft aim to enhance the integration of their complementary ATM product portfolios and offer further benefits to their customers. After three years of development and expansion work at Frequentis Comsoft, Gerald Enzinger hands over the management agenda to former Austro Control chief operating officer (COO) Thomas Hoffmann. Frequentis Comsoft hosted the first Surveillance Data Distribution System Networking Group at the end of October to address user needs, exchange ideas and share current working practices with air traffic control and military organisations. Under the theme 'The Future of Aeronautical Data Communication', this year’s CAUG addressed a diverse agenda of topics reporting on the trends and future developments in air traffic services, including SWIM, security and message handling. Estonian Air Navigation Services (EANS) has successfully completed the next step in its major AIM modernisation programme with Comsoft Solutions. Instituto Nacional de Aeronáutica Civil (INAC) in Venezuela has begun operating the Comsoft Solutions AIDA-NG message handling system, to create the second South American inter-regional gateway following Peru. Comsoft Solutions will supply the Eurocontrol Network Manager with ETFMS entry nodes for Casablanca in Morocco, Sarajevo in Bosnia-Herzegovina, and Riga in Latvia to facilitate improved efficiency and help these states to better manage air traffic volumes. 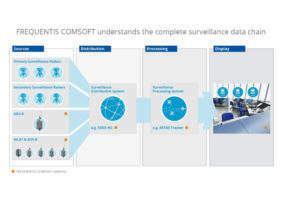 Over 30 sites now operate Comsoft Solutions state-of-the-art SDDS-NG that safely and easily interconnects any system that handles surveillance data. Installation for Danish ANSP NAVIAIR is successfully completed by Comsoft Solutions, supporting international air traffic growth. The Department of Civil Aviation of the Republic of the Union of Myanmar (DCA Myanmar) has now completed its planned ICAO AIS to AIM roadmap modernisation by installing the COMSOFT Solutions AIM system and Frequentis SmartCharting tool. PANSA successfully enhances surveillance coverage with COMSOFT Solutions WAM network in Gdansk. The Finnish air navigation service provider ANS Finland has installed quadrant sensors and transmitters in order to provide WAM and ADS-B coverage for more than 80% of the Finnish Airspace. The final WAM network will include more than 100 ground stations in Southern, Central and Northern Finland providing enhanced surveillance and a coherent air situation picture. Belgocontrol, the air navigation service provider (ANSP) for Belgium has successfully completed a midlife software and hardware upgrade of its aeronautical message handling system (AMHS), AIDA-NG, in order to provide further enhanced reliability, performance and message handling functionality. The upgraded system consists of Comsoft solutions AIDA-NG, CADAS-ATS and CADIR products with European Directory Service (EDS) support. The Department of Civil Aviation of the Republic of the Union of Myanmar (DCA Myanmar) completed site acceptance of Comsoft Solutions' AIM system, transforming their aeronautical information management and thus supporting their increasing air traffic. Building on the 2016 launch of the Quadrant starter kit, Comsoft Solutions has launched an enhanced all-in-one-box solution to now include RAPS-3 functionality for analysis, testing and validation of surveillance sources. The Civil Aviation Authority of Venezuela, Instituto Nacional de Aeronáutica Civil (INAC), has contracted COMSOFT Solutions to deliver and install an Aeronautical Message Handling System (AMHS) solution based on their market-leading product AIDA-NG in order to transform the way in which they transmit messages and aeronautical data. Comsoft Solutions will provide Estonia with a SWIM-ready AIM solution facilitating the next steps in the ICAO AIS to AIM roadmap. 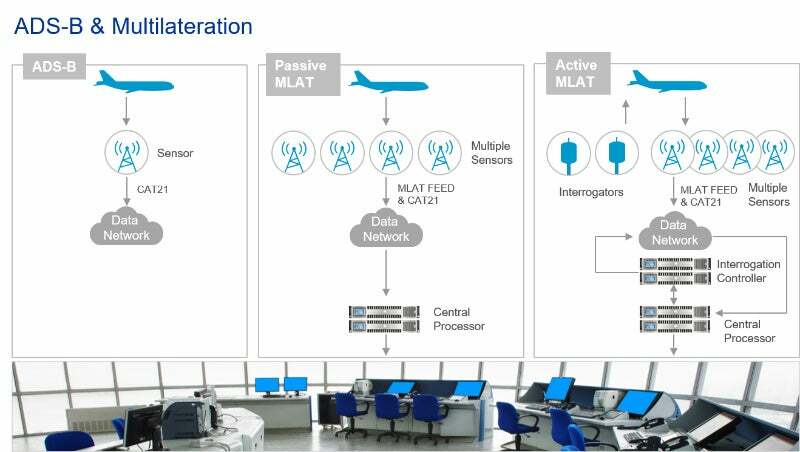 Air navigation service providers (ANSPs) are globally moving from Aeronautical Fixed Telecommunication Networks (AFTN) to ATS Message Handling Systems (AMHS) to enable a highly performant and future-proof environment for current and future rich data exchange. Comsoft Solutions to complete cutting-edge wide area multilateration (WAM) network for Danish ANSP NAVIAIR. The upcoming ARTAS version V8B4 will provide enhanced functionality for en-route, approach and a prototype for surface movement tracking. Comsoft Solutions will be exhibiting their surveillance solutions at this year's ATC Global, which has united the international air traffic management community for many years. Flawless flight plans are an important prerequisite for future automated flow and capacity management, increasing flight safety and reducing operator workload, while managing increased flight volume. The air navigation services provider (ANSP) of Slovak Republic, Letové prevádzkové služby (LPS), has successfully upgraded their AIDA-NG AMHS system with Comsoft Solutions, enabling enhanced reliability, performance and functionality. Comsoft Solutions has announced its new organisation chart, establishing six clear business units, and appointing six experienced Comsoft Solutions employees as business unit directors. EUROCONTROL has put their full trust in Comsoft Solutions by allowing them to fulfil all prior EUROCONTROL projects, since joining the Frequentis Group. Portuguese ANSP, NAV Portugal, has selected Comsoft Solutions' state-of-the-art Surveillance Data Distribution system (SDDS-NG) for advanced data exchange of surveillance data sources for mainland Portugal, the Azores and Madeira. COMSOFT Solutions' AIM and AMHS users showed their continuous support at the ninth annual user group, CAUG, under the motto 'Continuity with new perspectives'. Global AIM, organised by the International Federation of Aeronautical Information Management Associations (IFAIMA), is taking place this year in Rio, Brazil, with AIM experts gathering under one roof to talk about the latest AIM developments and innovative ideas. Comsoft Solutions has carried out successful site acceptance of eAIP production tool CADAS-EPS for the ANSP of the Netherlands, Luchtverkeersleiding Nederland (LVNL) - its first since becoming part of the Frequentis Group. Comsoft Solutions' head of sales, Markus Heichel, and Frequentis' head of ATM Automation Solutions, Günter Graf, will take to the Frequentis Aviation Arena on 9 March, 12:30-13:00 to talk about Frequentis and Comsoft Solutions in a presentation: 'Working In collaboration for a safer world'. Comsoft Solutions Uli Kaage will present the Frequentis Groups compelling solution for submitting AIP specific digital data to ANSPs. The solution also makes the move towards a fully digital data management of airport relevant static and dynamic data. 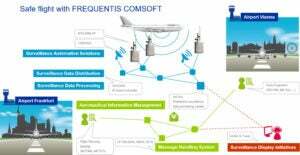 COMSOFT Solutions to highlight innovative AIM, AMHS and ADS-B, while demonstrating continuity with new perspectives since becoming part of the FREQUENTIS Group. The new Frequentis subsidiary 'Comsoft Solutions' has acquired parts of the ATM business of Comsoft. An experienced management team led by Gerald Enzinger will focus on realising growth opportunities, particularly in the European and Asian markets. The Frequentis Group, a strategic investor with headquarters in Vienna, Austria, will take over the main assets and projects of air traffic control and air traffic management business COMSOFT in Karlsruhe. The ANSP of Georgia, SAKAERONAVIGATSIA Ltd, has completed the successful installation of German expert COMSOFT's core AIM Database, CADAS-AIMDB, which uses latest AIXM 5.1 technology and facilitates completion of the vital second phase of the ICAO AIS to AIM Roadmap. COMSOFT Aeronautical User Group (CAUG) took place in Karlsruhe, Germany, this week, bringing together its worldwide users to discuss operational and technological challenges arising from new technologies applied in the Aeronautical Information Management (AIM) and Aeronautical Message Handling System (AMHS) domain. COMSOFT have completed the prestigious MEVA-III VSAT project, providing a regional VSAT network for 15 ANSPs at 18 sites in the Caribbean, as well as Latin, Central and North America, allowing for a new and more efficient communication system, using the latest VSAT technology, SykWAN, from long term partner ND SatCom. New York-based radar system supplier C Speed and Germany-based COMSOFT formalise their working partnership by signing an official teaming agreement at the 2015 CANSO World ATM Congress. The Tanzanian Civil Aviation Authority has again chosen COMSOFT to assist with their goals of efficient and modernised air traffic services, with the addition of COMSOFT's Aeronautical Billing (CAB) solution. Georgian air navigation service provider SAKAERONAVIGATSIA have added an important maintenance contract to the scope of their Aeronautical Message Handling System (AMHS) contract with German ATM expert COMSOFT. World ATM congress 2015 to highlight data management while COMSOFT bring automated billing solution to the stage. EUROCONTROL awards COMSOFT further five-year contract for Centralised ARTAS Maintenance and Support (CAMOS) as industrial partner. Crucial ADS-B project for northern Vietnam will enhance en-route coverage while also improving air surveillance in the eastern waters. The African Technology Seminar highlights the value of COMSOFT’s advanced ADS-B and AMHS systems for Tanzania. SAKAERONAVIGATSIA implements COMSOFT's premium AMHS solution. Following comprehensive testing procedures the national ANSP of Georgia SAKAERONAVIGATSIA has site accepted its AMHS/AFTN system, which went operational after an error-free reliability test period. A new cost-effective access to ATC services has been taken into operation by QCAA. Alongside with their state-of-the art AMHS and AIM infrastructure QCAA has taken a sophisticated email and internet solution into operation enabling end users and administrators to access the respective services in an easy and cost-efficient way. The Algerian ANSP adapts its flight data processing systems to the new ICAO flight plan format. To be able to seamlessly effect the transition to the new ICAO flight plan format, ENNA has chosen COMSOFT's cutting-edge flight plan converter AIDA-FPL. Following a successful site acceptance the ANSP has taken the converter into operation and is now all set for the ongoing transition. Serbia and Montenegro Air Traffic Services Agency opts for COMSOFT's leading FPL converter technology. Having selected COMSOFT as their partner to supply SMATSA (Serbia and Montenegro Air Traffic Services Agency) with its leading flight plan converter technology, the ANSP is now all set for the new ICAO flight plan format. FT Automacao Industrial selected COMSOFT to undertake the installation of their new Surveillance Data Distribution System SDDS-NG in the Amazon area. The German ATC supplier recently has been awarded a contract to provide FAB (Força Aérea Brasileira) with its SDDS-NG at 22 locations. The Finish air navigation service provider and airport operator Finavia has ordered a total of 39 of COMSOFT's Quadrant ADS-B sensors and 12 transmitters, to cover approximately one quarter of Finland. The Corporación Peruana de Aeropuertos y Aviación Civil (CORPAC) is pursuing its goal to establish the most modern ATC environment by introducing an AIXM 5.1 based AIM solution. ARTAS is to produce a uniform air situation picture from Finland's diverse surveillance data sources. Further Comsoft systems will enhance surveillance infrastructure. The Airports Authority of India (AAI) has awarded Comsoft a contract to perform ADS-B roll-out for 14 sites across India. On 22 September the Federal Directorate of Civil Aviation (FEDCAD) of Bosnia-Herzegovina transferred their operational services with ease from AFTN to AMHS. Hong Kong and Macao, Special Administrative Regions of the People's Republic of China, have moved their aeronautical messaging service from AFTN to the new standard AMHS. Outstanding engagement on the customers' side impressed German system supplier COMSOFT and underlines the system's maturity.